Cross-country season begins in early May, and runs through to the end of July - the full list of dates is published below. Unlike track and field in the summer, the venue for cross-country events moves around, with locations including the Abefeldie athletics track in Essendon, our track at Keilor, Coburg, Preston-Reservoir, and Sunbury. There are also regional and state championships. Cross-country involves athletes running one event, with (approximate) distances listed below. Keilor joins in with a group of other clubs to hold these events. Cross-country events are never cancelled for wet or cold weather - instead please ensure that your athletes are dressed appropriately, which can include long black pants, and warm black tops under the Keilor top. Subway name patches are still required. There are also cross-country and road relay events, over the same distances. 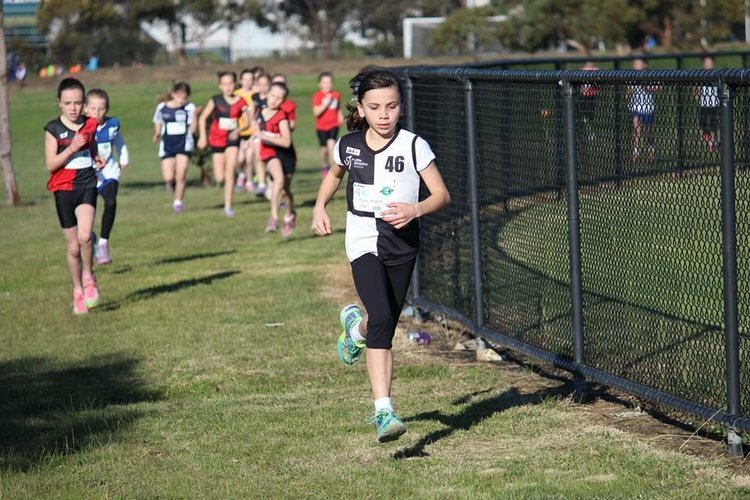 Keilor members who have have joined for the summer track and field season can compete in cross-country without paying additional registration fees, although event fees may be payable. 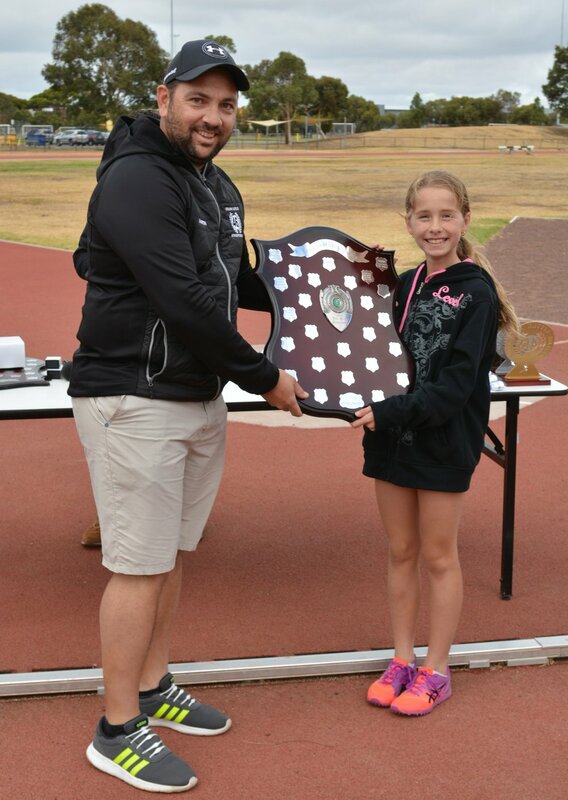 At the conclusion of the track and field season, Keilor Little Athletics awards a number of trophies, including Boys and Girls Champion, and Volunteer of the Year. The Boys and Girls Champion are chosen based on points based system, which rewards both participation and performances. This system has been carefully calibrated so that athletes from any group can win this. The Volunteer of the Year is selected by the committee, and is always a difficult decision for the committee to make, as there are always many suitable nominees. Girls Champion - U9 Sienna Gec. 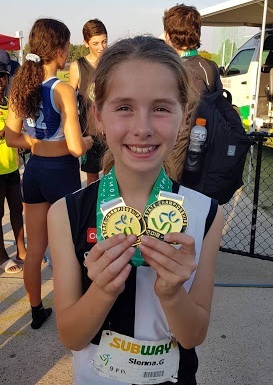 Sienna has had quite a season, also winning two golds medals at the State Track and Field Events, a gold medal at the State Relay Championships, and the U9 gold medal at the State Multi-event. Boys Champion - U10 Koby Bewick . 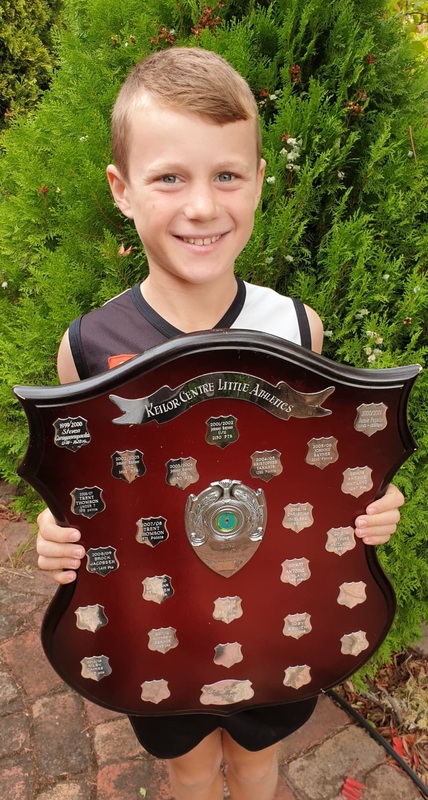 Koby is our centre champion for the second year running, and besides this award, won two bronze medals at State Track and Field, and also a gold and two silver medals at the state relay championships. Volunteer of the Year - Michelle Graham. Michelle has the very challenging role of managing Team Keilor at regional and state events, which involves liaising with regional and state bodies, monitoring participation, creating a roster list, managing a roster list on the day, liaising with event directors, dealing with all participation families, and then writing a post-match report. Altogether this is a huge committment, and Michelle does this in a very calm and friendly manner. Michelle, like Sienna above is shown with our outgoing Centre President Aaron Carmichael. Aaron had the very difficult job of Centre President for a year, and left the centre in very good shape - we thank Aaron greatly for his hard work during the year. Presentation Day was another successful day, with many many athlete taking away medals or trophies. And as always, the day included the finals of the Tim Golder 100m Handicap, and the running of the 800m handicap. A great set of photos is found on our Facebook page - and some of these are shown below. With the excitement of the Centre Champs now over, it is time to focus on the next event on the calendar, the Presentation Day. We will follow this with the Warren Hosking 800m Handicap - again one boys and one girls race. There will be be some awards handed out to parent volunteers, including the prestigious “Volunteer of the Year”. Athlete participation medals and trophies will then be handed out. There are a variety of trophies for a variety of achievements, including the Centre Boys Champion and Centre Girls Champion - which can be won by athletes of any age group. BBQ sausages and drinks will be supplied to the athletes. This is a big day for the club and our athletes - we hope to see you there. Yes, it is our AGM tomorrow Saturday 22 March, and there will be our report presented, and the new committee elected. And as part of that, we need to present our annual report - and here it is. 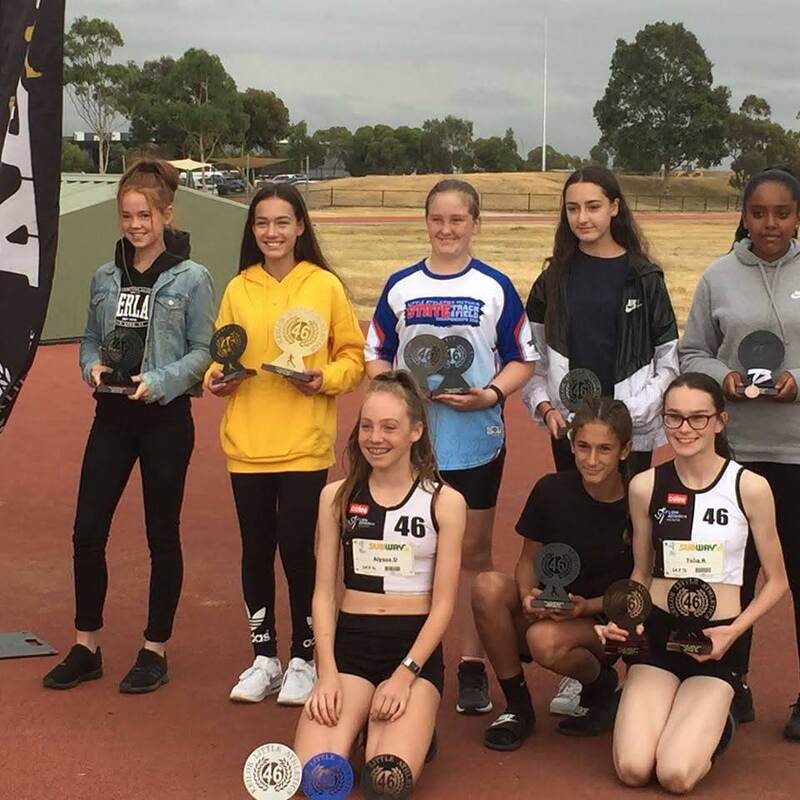 Congratulations to our 46 Keilor athletes that competed over the weekend at the State Track and Field Championships at Casey Athletics Stadium. This event saw athletes from across the state competing against one another and challenging each other to perform at their very best. We saw many outstanding performances with Team Keilor collecting 22 medals and most of our 46 athletes achieving personal best performances. A fantastic achievement. Congratulations to all of TEAM KEILOR, the athletes, families and committee for a great weekend of sportsmanship, wonderful personal best performances and positive support and loud cheering for all our athletes. A fantastic effort. Go Team Keilor - Let’s do it all again next year. Have your athletes qualified for participation trophies - and the Centre Champs? Keilor athletes need to participate in over 50% of our events in order to qualify for participation trophies and their entry into Centre Champs (Note that Centre Champs also have minimum roster requirements). So has your athlete/s met this benchmark yet? Or are they close? Check out the link below to see if they can participate in our Centre Championships. What a fantastic weekend Keilor Team. Congratulations to all our wonderful athletes on their great performances. Attached is the placings for each athlete. We finished with 37 GOLD, 35 SILVER and 29 BRONZE medals and 4th overall in medal tally & points scored. A big thank you to all parents/family members who helped perform all the duties over the weekend. I will get the progression for athletes hopefully by the end of the week and pass on the information. I believe you will also get an individual email from LA vic for each athlete who will progress to State. I have many place cards from the weekend I will leave them in the club room on Saturday for your collection. Congratulations to our many individual athletes gaining multiple medals. Michelle Graham - Team Manager. PS the picture below shows our 4 times Gold medal winner Frank Mazza, showing the secret to his success - his feet don’t touch the ground…. Another successful Keilor Gift was run today, with 16 Keilor Athletes demonstrating to our wider community what our athletes are capable of. All participants received a medal and a backpack, and the atmosphere was great. Does this sound you like you? If you have an U12 athlete next season, keep your eyes peeled out for your invitation - and they too can participate in this great event. STATE COMBINED EVENT: We have a STATE CHAMPION! Congratulations to SIENNA GEC U/9 for winning her event on Saturday. Keilor was represent at the State Combined events by 20 athletes from the U/9 – U/16 age groups. Congratulations to all of our athletes who performed extremely well and achieved many personal best performances while competing in very hot conditions. Fantastic results Team Keilor – Hope to see more of our athletes try this event next season. While the track and field season is well underway, new athletes can still join - at now at a discounted price of $100. The only thing you will not eligible for is the regional/state track and field carnival - due to eligibility requirements. But you will be eligible for regional/state cross-country events. Membership is open to all youth aged 5 to 15 years old - read more about joining Keilor via the link below. STATE RELAYS 2018 - AMAZING RESULTS. What a talented team of athletes we have at Team Keilor. Thank you to all the athletes for their wonderful running, showing great team spirit determination to succeed, running personal best times and giving the Team Keilor cheer squad of parents, family and coaches many reasons to cheer, smile and be extremely proud of your efforts. Thank you also to our wonderful team of coaches Tim Golder, Brian McEvoy, Steve Scodella, Michael Gec and their many helpers. Make sure you look at all our relay photos on our Facebook page. Go Team Keilor - Let’s do it all again next year! Congratulations to our Keilor ‘Champions of Champions’ for winning multiple titles at this weekend’s School Sport Australia (SSA) Primary (10-12)Track and Field Championships held here in Melbourne at Lakeside Stadium. To have so many athletes win National titles from the one club is truly amazing!! Dilan Egodowatte (12 year old boys) - Gold in the 800 metres and Silver in the 1500 metres. Chanachai (Lay) Kanakrok ( 12 year old boys) - Gold in the long jump, Silver in the 100 metres sprint and Silver in the 4x100 metres. Max Bussutil (12 year old boys) - Gold in the 200 metres, Silver in the 4x100 and Bronze in the 100 metres sprint. Stephanie Afano (10 year old girls) - Gold in the Shot Put. Congratulations again to Stephanie, Lay, Max and Dilan on their National tittles !! 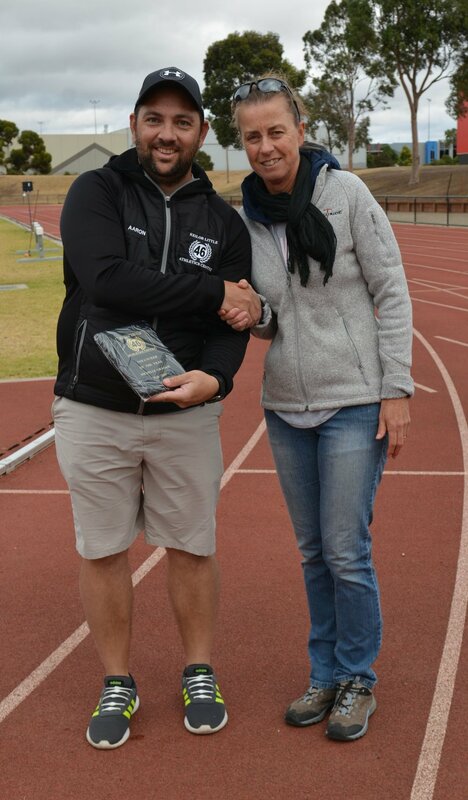 Congratulations to TEAM KEILOR on winning the overall team score at the Northern Metro Relay Day on Saturday at Coburg. It was so wonderful to hear our Keilor Team of athletes and parents cheering on all the teams as the ran for gold and Personal Best performances. The smiling faces on our athletes said it all. It was a mixture of success for our older more experienced teams in the Under 15 & 16 athletes as well as excitement for our new relays teams in the U/9’s. Special mention should go to our 30 teams who received a GOLD MEDAL and will automatically qualify for the State Relay Competition in December. Please take a look at photos of our wonderful athletes on our Facebook page. Thank you to all parents who fulfilled duties during the day to help the program run smoothly. A BIG thank you to our wonderful dedicated coaches for all their hard work in training over the past few months. We look forward to seeing what your teams can achieve at the State Relays in December.